Public discourse about wage gap or wage discrimination in Finland is mostly gender-based -- but not only women are negatively affected by wage differentials between people doing the same kind of job for the same employer in Finland. Foreigners, or non-Finns, - men and women alike - are a vulnerable group susceptible to many forms of discrimination and unequal treatment, including wage discrimination. Studies show that women are paid less on average than men in "virtually all labour markets", and the Finnish labour market -- where women receive wages that are some 15-30 percent less than men´s wages -- is no exception. Gender wage differentials may arise from labour market segregation or employers may simply pay lower wages to their female employees than their male employees for the same type of job (Korkeamäki, Ossi, Kyyrä and Tomi 2003). According to Korkeamäki et al (2003) such "within-job wage differentials" between men and women could be interpreted as wage discrimination against women. According to a Yle report, gender pay-gap in Finland is worse than in the rest of Europe. It turns out that not only women are subjected to wage discrimination in the Finnish labour market. Foreigners are also susceptible. According to information reportedly obtained by Yle from a State Administrative Inspection Agency, foreign IT employees working for Nokia in Finland were paid much less than Finnish employees. Indian, Chinese and Polish IT employees who worked for Nokia between 2014-2015 were paid salaries as low as 750 euros a month - much less than Finnish employees. Yle reports that from the obtained documents foreign workers who worked in product development design earned 50-70 percent less than their Finnish counterparts. Worthy to mention that according to the Union for Professional Engineers in Finland the salary for work done by the foreign workers discriminated against by Nokia should be at least 4000 euros a month. Compare that to the meager 750 euros a month that Nokia paid them. 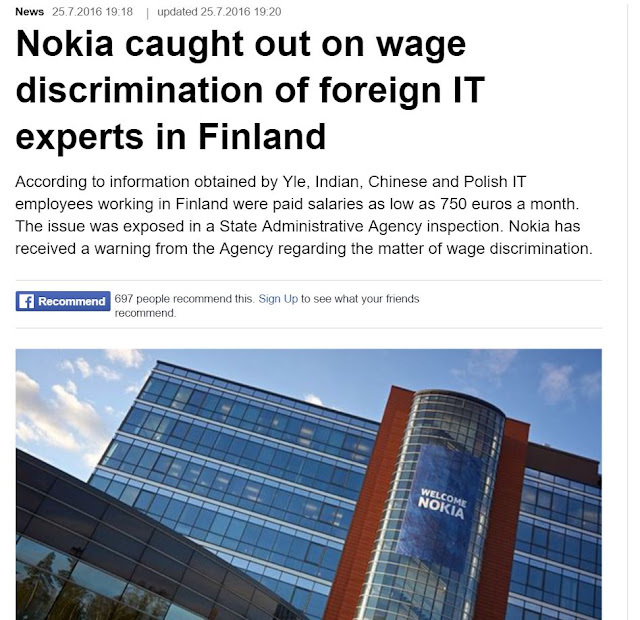 According to Yle the issue of wage discrimination against foreigners in Nokia was exposed in a State Administrative Agency inspection, and Nokia received a warning from the agency regarding the matter of wage discrimination. First of all, a mere warning for wage discrimination by a multinational information and information technology company - or what remains of it - is grossly insufficient reprimand for such an illegal act in a country governed by the rule of law. Wage discrimination against women in Finland is a serious problem worth discussing and seeking solutions - but not only women are affected by wage discrimination. Public discourse about wage discrimination in Finland should be expanded to included all vulnerable groups, including foreigners - who are not only affected by discriminatory employment practices but also discriminatory wage differential. Although women as a whole are adversely affected by wage discrimination it is possible that foreign women are paid even less than their Finnish counterparts for the same kind of work in the Finnish labour market. The fact that foreign workers in Nokia were paid up to 50-70 percent less than their Finnish counterparts is alarming. And that is just Nokia. What transpires in other companies and workplaces and in other sectors can only be left to the imagination. If more inspections are carried out as intended by the Regional State Administrative Agency I believe there will be more shocking revelations that would damage Finland's reputation among countries that pride themselves as champions of equality. According to Korkeamäki et al (2003), women in the Finnish labour market take home 15-30 percent less wages than men. According to Yle, studies show that women in the Nordic country earn on average 18 percent less than men. I reckon the average is higher among foreigners. This is not to say wage discrimination against women is not an important subject; it is to say that wage discrimination among other vulnerable minority groups like foreigners is equally important and worth looking into. After all, it has been said that "injustice anywhere is a threat to justice everywhere." Selective outrage to cases of discrimination is in itself discriminatory. It is unfortunate and unjust that Nokia seems to have, more or less, gotten away with such a scandalous violation of national and international human rights standards on equality and non-discrimination with a mere slap on the wrist in the form of a warning. Imagine a world where all offenders got away with warnings. A satisfactory consequence of such a blatant transgression, I think, would be reparation to victims - in addition to punitive measures. The near-silence on the matter by Finnish civil society and equality advocates - many of whom are usually vocal on matters of inequality, especially when it involves women - is telling. Perhaps the muted response by the Finnish public is because victims of the violation are foreigners. Perhaps Finnish society and the powers that be would have been more concerned and outraged if the affected workers were Finns - or women. Fortunately or unfortunately, Finnish workers were not adversely affected by the scandal -- they in fact earned 50-70 percent more than their foreign counterparts, according to Yle. I was always paid less than my Finnish co-workers. It us scary to try to find out how much is this difference. To be a foreigner in Finland is fine if you're visiting but you're gonna have a lot of trouble if you wanna work and live here. That’s why I decided to leave this country. Now it's a matter of time until I do it. But it's so dissapoiting to find out how the Finnish work culture is.